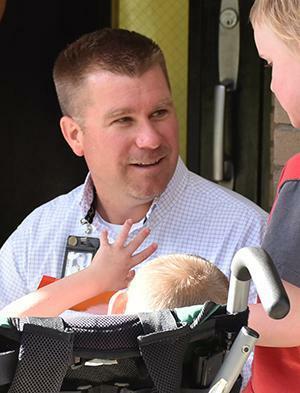 PSES Principal Justin Cowan shares his perspective on competency-based education, and how the Summit Learning instructional approach, new to the fourth-grade level this year, has found a home at the elementary school. What are your thoughts about competency-based education? How will the Summit Learning approach provide a better learning experience for your fourth-grade students? The idea of competency-based education resonated with me right away. Years ago, I had attended a private K-12 school, Pagosa Christian School, where students needed to achieve mastery of a subject by applying themselves. My teacher — or facilitator — would help me move through the lessons by pointing me to a resource or reteaching me that section of a module. So, the idea of personalized learning or taking ownership of your education was something that I had already experienced, and I knew how valuable it could be. From a principal’s perspective, I feel that competency-based education is a good thing. We want kids to have mastery over the content they are learning. If they don’t get it, then we teach them instead of just moving them through the curriculum. Or, we point them to the right resource — something they can listen to, read about, or do a hands-on experiment — that will do the reteaching for us. When we discovered the Summit Learning instructional approach, I knew that we had found the same kind of thing, yet the whole concept was replicated through technology, making it much easier for us to implement, especially on a larger scale. The program offers a ton of resources that would take us a lot of time to put together for each different kind of learner. Plus, our teachers can instantly access the data the program provides and then decide how to assist individuals or groups of students at any given time. Students have a better chance of mastery when they have this kind of support. Did you conduct a lot of research before you decided to implement the Summit Learning program? Yes, we did. Competency-based education has been the leading vision for the district for a while now, and each of our schools are discovering ways to incorporate these ideas into the curriculum and school culture. At the elementary school after thorough discussions about our school’s specific needs, we moved into the discovery and research phase about two years ago, examining different options. When we learned about Summit Learning, we visited several schools to see how the platform worked inside the classroom. Once our team had determined that Summit was the right fit, we actually had to apply to the program, and that was a rigorous process. After our application was approved, all of us had to go through extensive training. It is an ongoing, heavy lift, but it’s definitely worth it. Is the Summit Learning approach only available for 4th graders? Summit Learning has programs for 4th to 12th grade levels, so for us now, it’s just the fourth grade. They are working on curriculum for third grade, but that level is not ready yet. Students below the third grade probably are not ready for the technological aspect required in the program. They need to have certain technology skills, which we’re building at the younger levels. But, students have to be ready to take ownership, and that has to be done at an age-appropriate level with the appropriate technology skills. Can you explain the readiness level of students and what you’re hoping to achieve with students at the fourth-grade level? Much of what we’re trying to teach our students is based on the 16 Habits of Success, which we can start at any level. With the higher-level students, we can focus on helping kids develop certain cognitive abilities and skills, so they can achieve mastery over a subject or content, like math or science. We are trying to create a system where kids who leave our school are thinkers and problem-solvers. Some of those skills may not come naturally to all of us, so our job is to help embed those skills within every student. They then can go on and be able to apply those skills to whatever problems they encounter in life. Life is really all about problem-solving. For example, students will run into certain decisions they need to make in order to enter adulthood. They need to ask themselves questions like, which college or trade school should I attend? What kind of work do I want to do, and what’s the best way to do that? Do I want to be a dentist, an accountant, a carpenter, or an electrician? Do I need to become an apprentice or a journeyman? Developing cognitive abilities in kids at a young age will help them down the road when they need to sort out those questions in life. How does the Summit Learning program help fourth graders prepare for middle school? It’s great preparation for what students will experience at the middle grade level, where they need to be familiar with the Google classroom and putting together a student resume. In their resumes, students are writing goals and determining what they want to be doing. They are creating individualized pathways to achieve that learning. So by offering a bank of resources from which our fourth graders can choose, the Summit approach introduces students to the idea that they are making the choice about how to learn. They are already taking ownership of their own education, which dovetails perfectly with what the middle school is doing. What Summit does is point students in a direction by providing pre-approved materials already resourced — videos, articles, books, radio programs, etc. What this does for them is to allow them to choose their pathway to complete the project. So instead of a one-size-fits-all approach, students get to choose, based on their strengths, their likes, their own personal preferences. It mimics the real world, so they are better prepared not only for middle school but also for life. What role does the teacher play in a Summit Learning classroom? Our teachers still teach; they still go through the lessons. What Summit does is allow them to teach in a better way. The technology accelerates the momentum of what we already do. It does not replace the teacher. It is not online learning, where students are basically learning the material on their own. Summit is a tool that we can use to enhance our experience — both teaching and learning. Students’ assignments, their products and resources are all right there on their Chromebooks via the Internet. They can access feedback from teachers, who can now provide that feedback more efficiently and effectively. We had an advisory program before we tried Summit; this is more like an advisory program on steroids. Teachers are called mentors in the Summit program, and that’s exactly what they do — they assist students every step along the way. Because the teacher can instantly access data that charts progress, he or she knows exactly where to focus. So does that mean with this program that the teacher can spend more quality time individually with each student? Can they address a student’s specific need more capably because they have a better perspective, based on data, on where that student is at? Exactly — individually with students or even with small groups. Summit Learning follows a regular schedule, so there are concrete times for project explanation, personalized learning, and mentoring. The teacher introduces and explains the project. Students access a playlist and then choose what resources they want to further understand the project. They complete checkpoints along the way. The teacher can then decide which student or groups need attention or haven’t completed the checkpoints. How does this program accommodate different styles and levels of learners? One of the concepts of Summit is that there is a low floor and high ceiling in any project. Anybody can access what they need to complete that project. So, for example, those kids with disabilities who have special education needs can access supports already built into the program. The same goes for students on the other end of the spectrum. Summit is a user-friendly instructional approach that allows students and teachers to set goals for specifically what that student needs to be working on to accommodate those needs. It takes a lot more work to include five different resources for five different levels of students. And if you want those resources to include a video, radio show, an article, a book, or some sort of collaborative work at those five levels, then you have 25 things to do for that one lesson. Summit facilitates all of that by providing pre-approved materials that are suitable for all levels of learners. What do you see as the benefits of the Summit Learning program? One of the benefits is that we are not just teaching kids content. In the 1970s, you might ask a teacher, “What do you teach?” and he or she would say “I teach Math.” I think our teachers would respond, “I teach students.” We’re teaching students how to be better thinkers, better problem-solvers. And we’re preparing them for life by mimicking real life in the classroom. How are students responding to the program? How are they making the transition? It was actually a lot easier than what I had prepared for. Our kids in this community just jumped right into it, and they’re loving it. The natural curiosity in elementary students works to our advantage because we tap into that. They love that their stuff isn’t everywhere, like in their locker. They can access their own information anywhere, even at home. It’s their choice, and they like that. This generation is used to accessing information and communication online. They kind of expect it. Has homework or the idea of homework changed because of this program? Research shows that homework is not a benefit to elementary students, so homework has not been a requirement here. Plus, I’m a principal that doesn’t believe in a lot of homework at this level. I want kids to go home, do chores, eat dinner with their family, go to soccer practice, read a bit, play with their dog, have some down time. Kids at these ages need to be in bed by 7:30-8:00, so there’s not much time to take care of the necessities, like eating, bathing and reading before bed. After school is over, there should be enough time for parents to engage and connect with their children. That’s just as important as what we do with them here at school. What would you say to a parent who was concerned that their child is spending too much time in front of a computer? We’re probably spending less time because we’re using online time more wisely. This program directs them to appropriate resources, so trying to find material by scrolling for 20 minutes on YouTube or other Internet sources is eliminated. The average kid spends 58 hours of their own time off school hours per week on computer, playing games or accessing social media. That’s like having a job. So, I want to actually decrease exposure to technology. If we’re using it, it’s solely for education; it’s solely to access resources needed to complete components of a project, collaborate, receive feedback from teachers, and as a storage for their products and goals. Is there any interaction in the classroom? Can kids still collaborate and discuss topics together? Yes, collaboration is a major part of Summit, and it’s a huge part of what we try to instill in our students — the ability to collaborate with each other. We already had a focus on encouraging students to work together. Summit enhances that. It is project-based learning and is built on checkpoints in modules, many of which require student collaboration. On an extensive project, students get pieces of the project and have to get their piece done before they can move on as a team. With Summit Learning, what does the future look like for the elementary school? After this year, we have to evaluate the program and see if it has worked for our kids in the way that we hoped it would. If Summit introduces a third-grade level curriculum, then we’ll have to make a decision whether or not to proceed at that level. Do you believe that Summit is a better way for students to learn? Competency-based education, regardless if I’m using Summit or not, is a better way for students to learn. The biggest plus with Summit Learning is that it wraps it all up in a nice little package that enables us as educators to address individual needs of each of our students. We have a cross section of Pagosa Springs that walks into our doors every morning. Kids come from all kinds of situations — good situations, bad situations, plentiful and needy ones. What I want is for each of our students to know that this is a safe place to be. This is a fun place to be. All the time I tell kids that this is their school. No matter what their situation is, during school hours they are in a predictable, safe, loving, caring environment where they can achieve at high levels. What we do on top of that, like introducing Summit Learning, is just icing on the cake.